I know you can't see much of the decorations in any case, but this is the best picture I've managed to take of it so far. You can get the idea of the lights and the general color scheme, anyway. 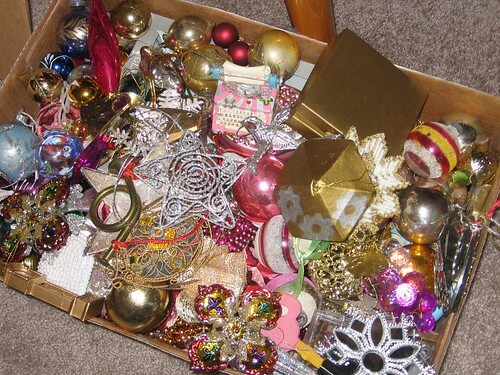 When I was collecting ornaments I concentrated on bright-colored, shiny things. We have some tinselly garland made into a chain, which has to be very near 20 years old - I know we bought it at the gift shop at work, one of the first Christmases we were married - and it was a darn good purchase because it looks new, still, after all these years. 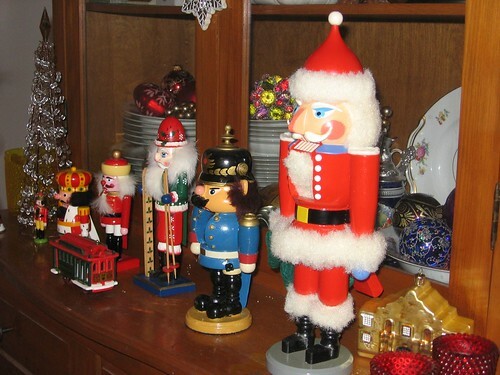 And I have a good many ornaments which are that old or older, especially now that I have my mother's stuff. I have a whole lot of vintage ball ornaments that probably came from our old trees, when I was a kid, and very possibly from my grandparents' house too. Here is the pile that I'm intending to put on the other (white) tree when I get around to putting it up. It's almost certainly way too many for that little bitty tree but better too many than too few ornaments, right? 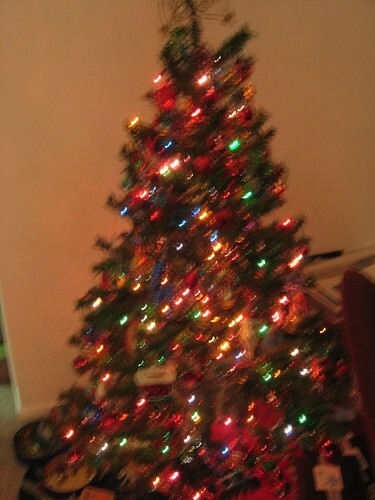 I didn't try to stick exclusively to pink ornaments, so there's pink and blue and violet, and gold and silver. I may modify this plan as I go, anyhow. Some of these ornaments are Mom's and some (more, probably) are mine. 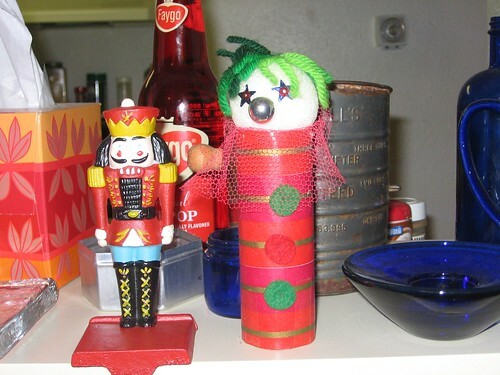 Here's the part we kept out of Mom's nutcracker collection. I like this smaller collection quite well. Incidentally, we were told by somebody who went specifically to look at them that Goodwill is selling the discarded ones for $10, at least for the bigger ones.